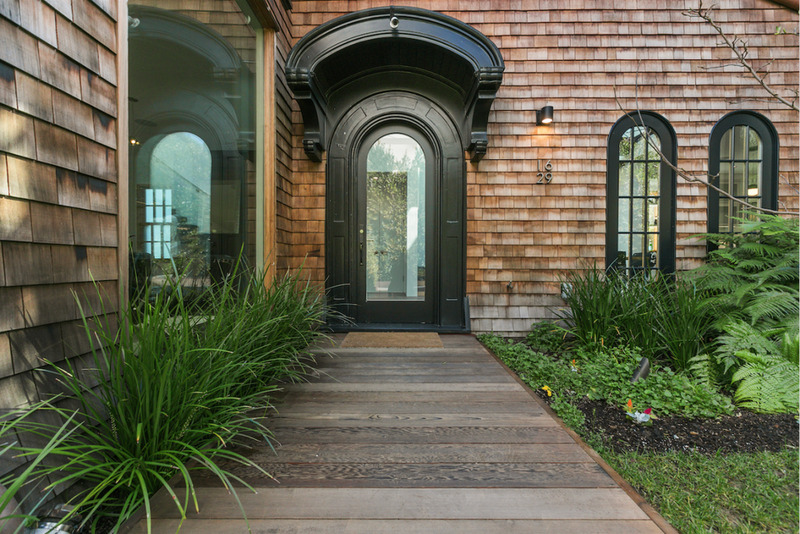 OPEN HOMES PHOTOGRAPHY – Originally built in 1917, Cow Hollow Residence features a First Bay Region Tradition style. At nearly $3 million, this isn’t your typical treehouse—no crooked ladders, haphazard flooring or windowless walls here. But it was virtually built from scratch in San Francisco. Make that rebuilt. And it’s just as charming, cozy and harmonious with nature as a beloved childrens’ treehouse. OPEN HOMES PHOTOGRAPHY – The remodeled home’s new exterior features warm wood shingle siding. 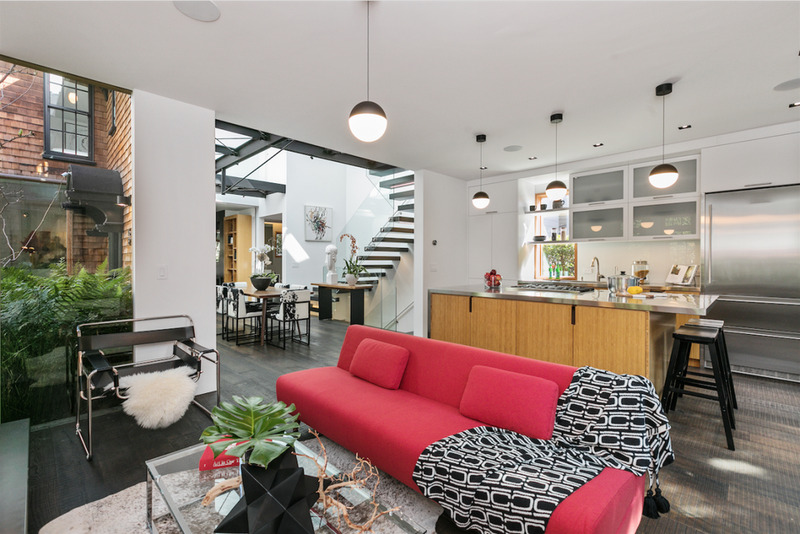 As a detached wooden condominium townhouse nestled in the Cow Hollow section of Pacific Heights, this historic, remodeled “treehouse” sits along tree-lined Green Street on a private, landscaped double lot. Even it’s location is quaint. 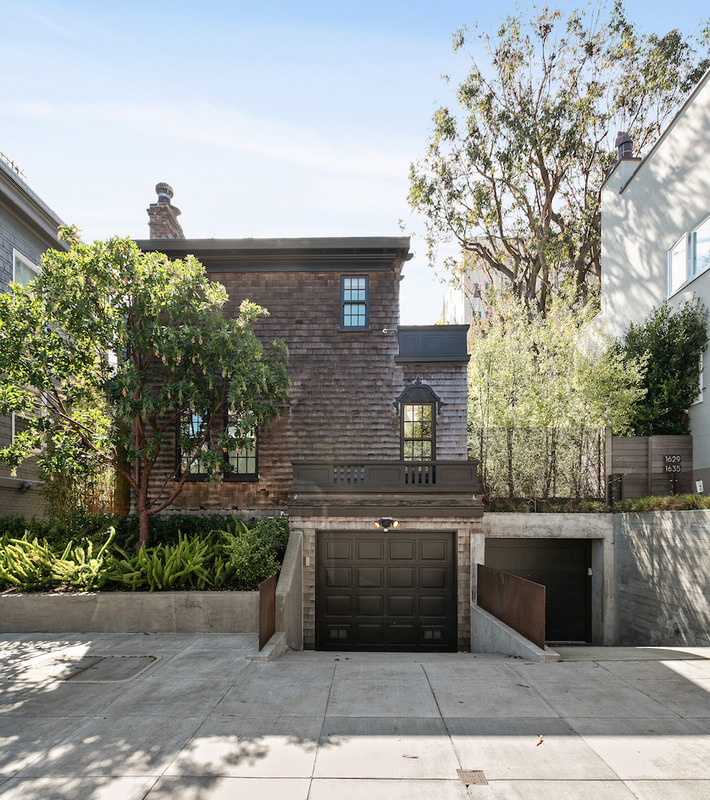 OPEN HOMES PHOTOGRAPHY – Cow Hollow Residence’s exterior was restored by architect Mark English. He also renovated the contemporary interiors. 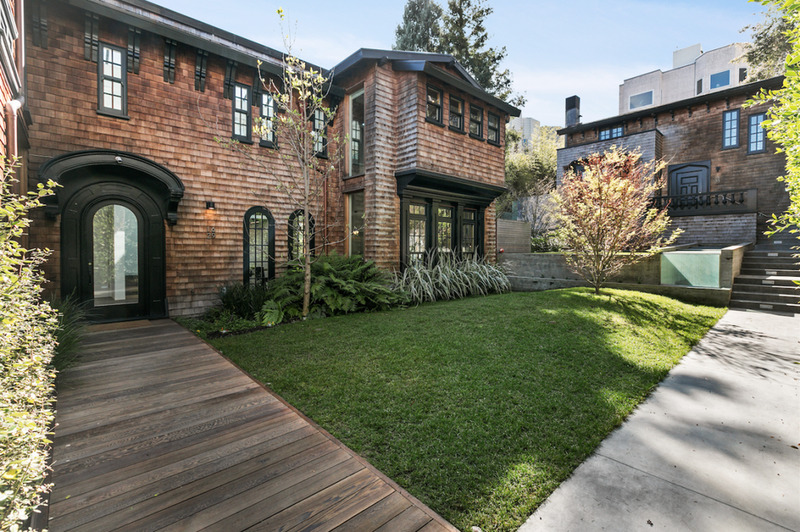 Constructed in 1917, Cow Hollow Residence was designed by architect Elizabeth Austin for original owner P.J. Martin Estates. But modern times required modern upgrades. Austin’s vision was preserved and improved for the 21st new century. Up for the task, modern day architect Mark English reimagined the traditional exterior and executed a masterful contemporary interior remodel with additions to the first and second levels of the wood and steel home. His design meticulously restored the home’s exterior to a First Bay Region Tradition style—a Bay Area spin on East Coast Shingle. Popular from the 1880s to the 1920s, this architectural style typically fuses nature, locally sourced materials, and superb craftsmanship. In fact, some exterior decorative elements were sourced from the recently dismantled 1915 Panama-Pacific International Exposition in the nearby Marina neighborhood, according to English. As a designated historic home, the restoration required strict planning and approval from the California Office of Historic Preservation (CEQA). 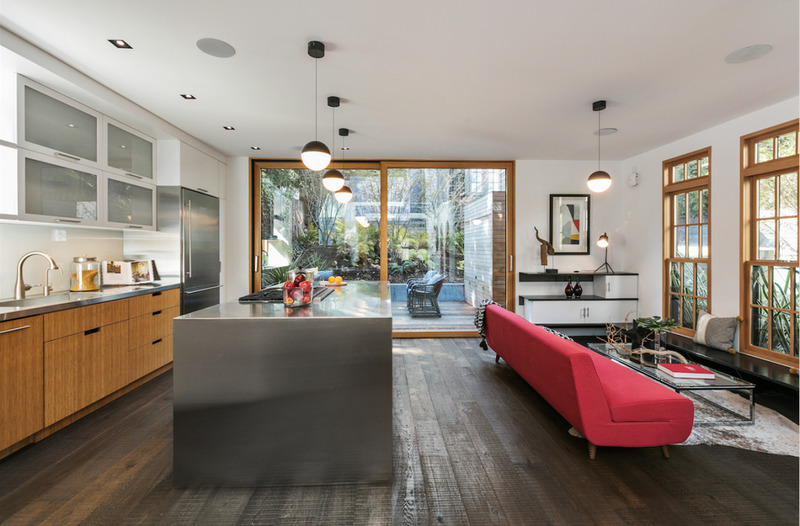 OPEN HOMES PHOTOGRAPHY – Cow Hollow Residence’s interior remodel included additions to the first and second levels. The new exterior welcomes via distinct yet warm wood shingle siding, brick chimney, diversified eave lines, and multiple roof gables. 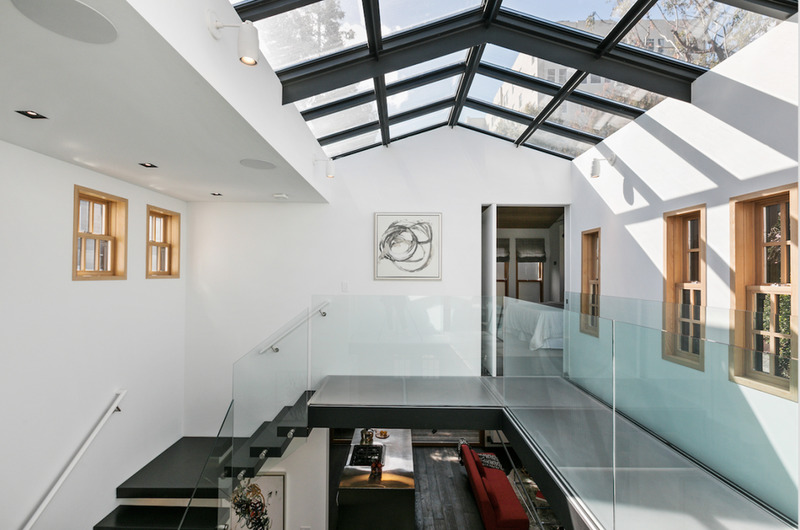 This contrasts the 2,710-square-foot home’s modern, open-layout interiors highlighted by a dramatic floating glass staircase, a bridge walkway and an extraordinary skylit atrium. The welcoming ambiance continues through a central gate into a landscaped, private garden. 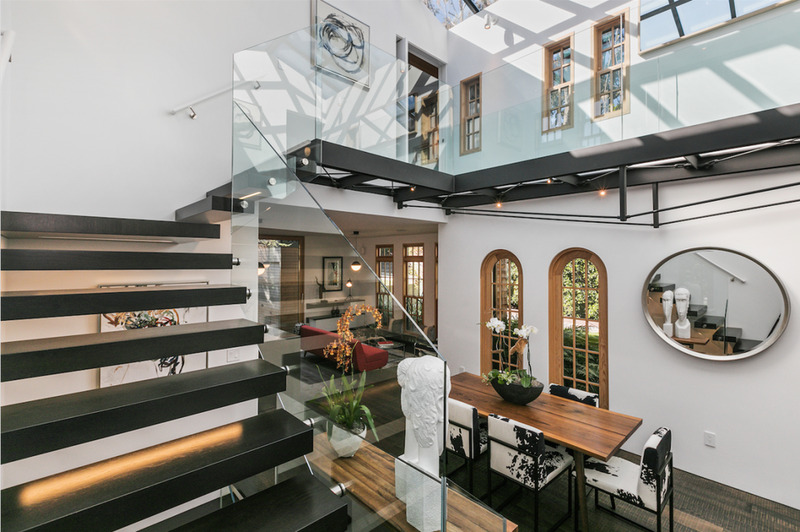 Just inside a gorgeous round-top entry door, a sun-drenched great room serves as a double-height atrium dining space—crowned by an overhead skylight and a dazzling glossy black cantilevered staircase with glass railing. 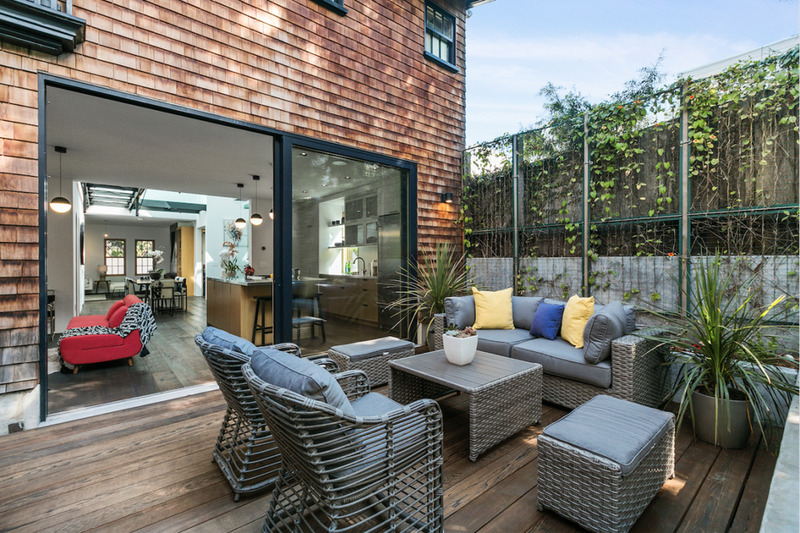 OPEN HOMES PHOTOGRAPHY – Sliding glass doors create an indoor-outdoor garden vibe. The great room opens to the exquisite chef’s kitchen with its striking stainless steel cooktop island, built-in microwave, glass backsplash, custom wood cabinetry, white lacquer cupboards, and idyllic garden views. The kitchen’s alcove is a unique space designed for formal dining or an extra family room breakfast nook with informal seating and floating shelves. High walls are primed for art work and come with in-ceiling speakers in the kitchen, atrium and living room. 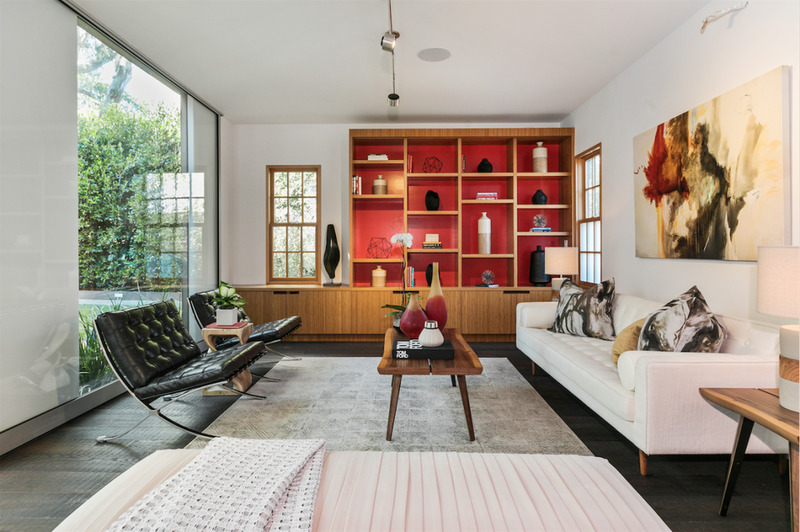 The living room is beautified with a wood-burning fireplace and walls of red-paneled, built-in wood bookshelves. 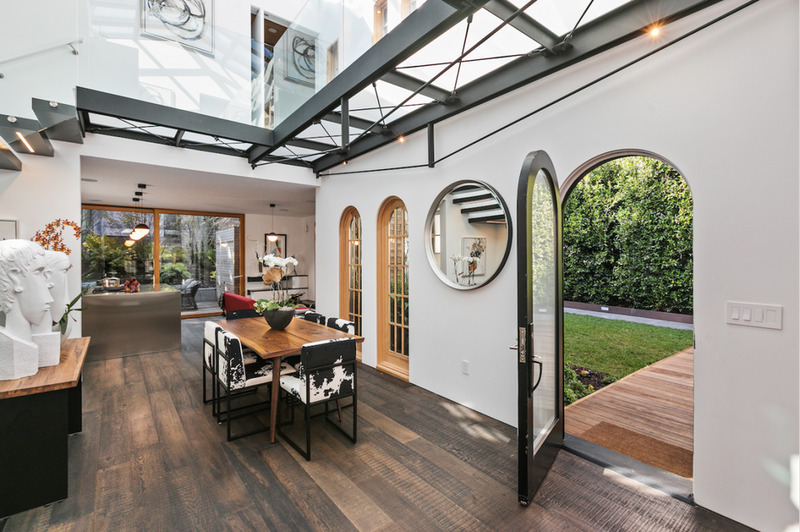 This flexible space can be privatized from the atrium area via a custom Fleetwood sliding glass door. 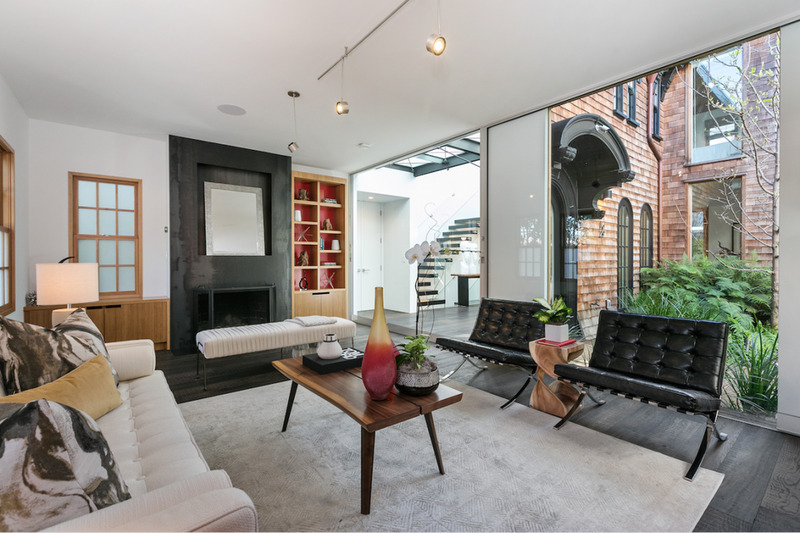 A floor-to-ceiling picture window frames the green garden while casement windows open to tree-lined Green Street. A coat closet and a chic powder room with lacquer vanity sit just off the living room. The kitchen’s south wall is offset by huge glass Weiland LiftSlide doors (which slide seamlessly into one another) for an indoor-outdoor garden-access vibe. 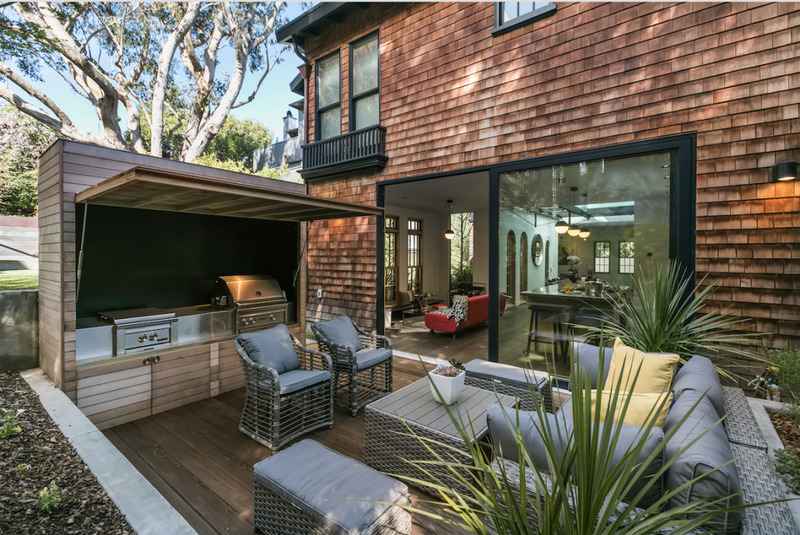 The outdoor entertaining patio includes a fold-up shed structure with built-in barbecue and storage space for al fresco dining. To access upstairs, one ascends the cantilevered staircase to a transparent bridge walkway—above the atrium dining room and directly beneath the towering skylight overhead. 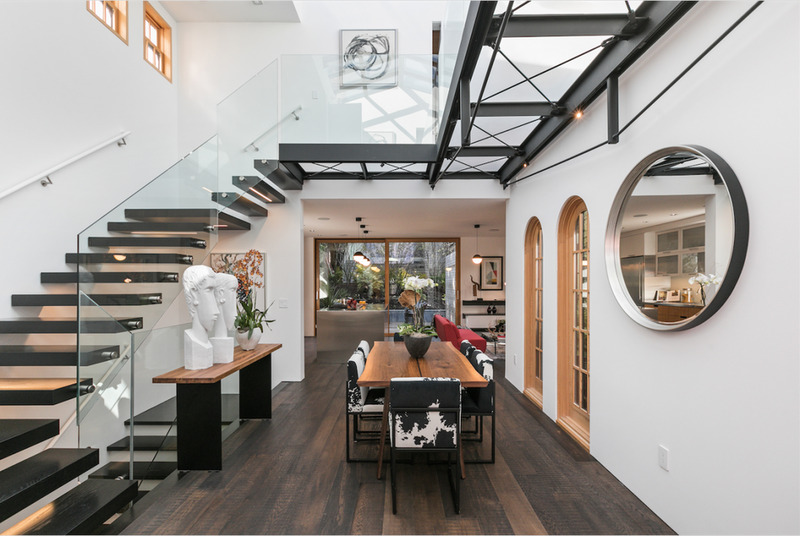 OPEN HOMES PHOTOGRAPHY – The massive overhead steel-and-glass skylight is a standout feature of the home. 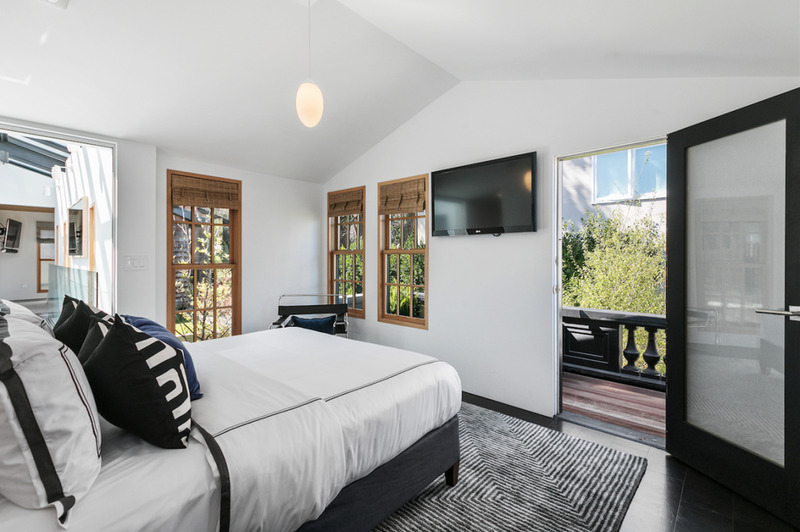 The master bedroom suite includes floating built-in nightstands and headboard, dark leather flooring, and casement windows overlooking the trees. 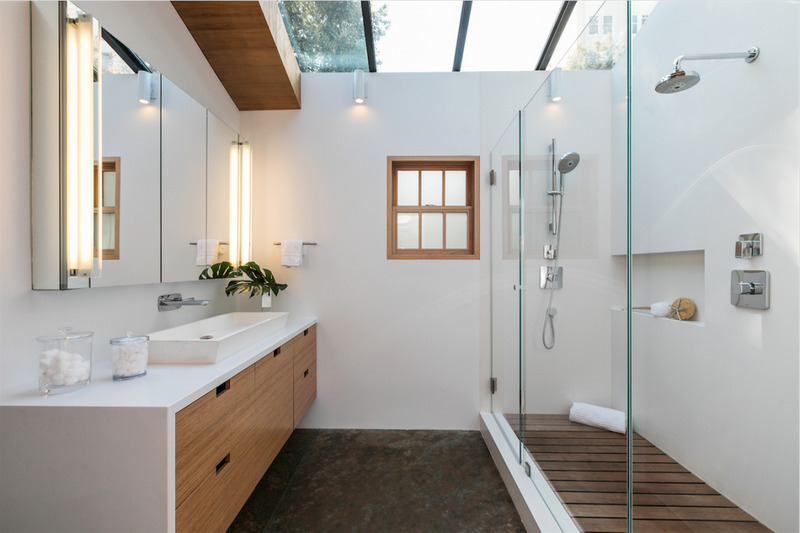 The en-suite bathroom has a glass walk-in shower, a quartz-topped floating vanity, separate water closet, and two walk-in storage closets. The guest bedroom also has floating nightstands, leather floors, and a balcony with garden vistas. Next to the guest suite is a laundry room with washer, dryer, counter, cabinets, and linen storage. 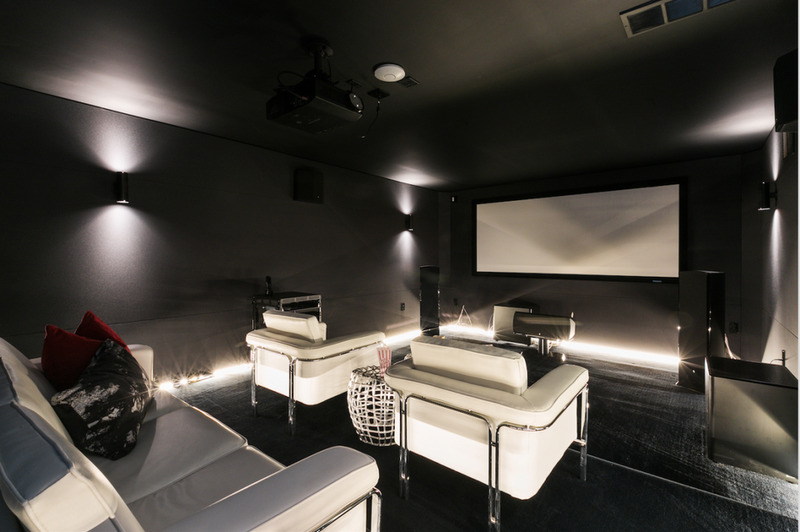 The lower level offers a sound-proof, film-noir-style media room boasting LED spot lighting, a projector and a built-in seven-speaker Revel home theater with three rows of tiered seating and an audio-visual equipment closet. The room could flex into an office or den. There’s also a powder room, tool workbench, and wine storage under the stairs. 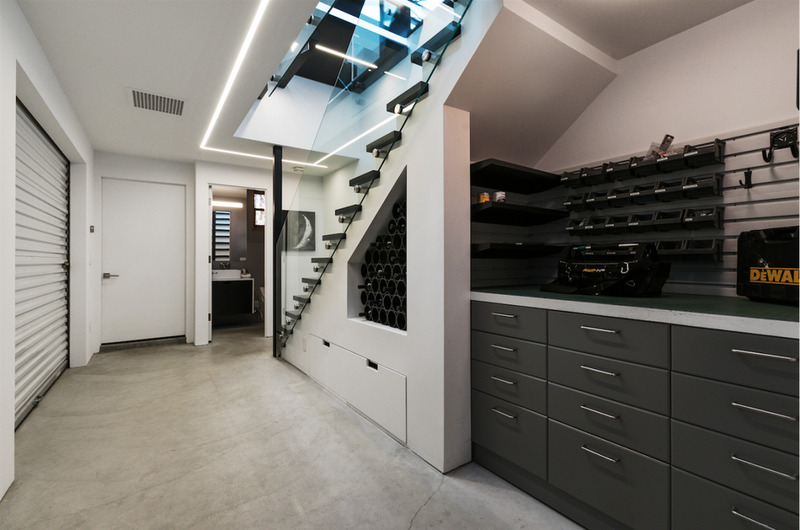 A one-car garage, which currently accommodates a gym, offers additional storage space, as needed. 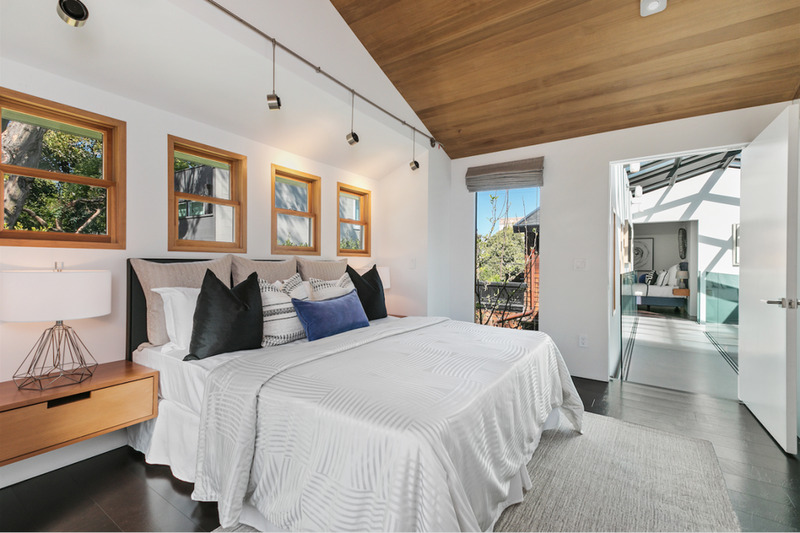 Cow Hollow Residence is loaded with technology features—Nest thermostats, dual aspect windows, hydronic radiant heating, and reflective roof materials to reduce solar heat gain. Cow Hollow Residence may not be the largest house, but it’s filled with big, beautiful ideas.